Inspiration for Jennifer's paintings is taken from still life to seascape and townscape subjects. Always evident in her work is the focus on light, shade and pattern. 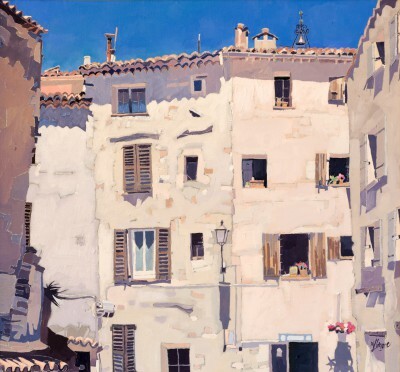 Her oil paintings of French villages and Italian townscapes are particularly sought after. from Scottish artist Catriona Campbell. and was a student of David Donaldson and Mary Armour. Latest works at Red Rag Bath are from Scottish artist Catriona Millar. Catriona produces bold, colourful art works. Her paintings are often inspired by her own life experience. Millar's paintings are highly recognisable and increasingly sought after. It's the Christmas show at the Red Rag Gallery in Bath. Many of the artists who regularly feature at the gallery are participating. David Barnes, Jo Bemis, Simon Garden, Paul Hedley, Amanda Hoskin, Paul Robinson and Robert Wells. The exhibition opens at 10:00 on Sunday 14 December and continues until the new year. Wonderful oil from RA artist Fred Cuming - now at Red Rag Gallery. Cuming is a painter of International standing. Born in 1930 he studied Art at the Royal College of Art. Fred Cuming was elected a Royal Academician in 1974. He is also a member of the New English Art Club. His paintings feature in many private and public collections. These include: Montecarlo Museum; Royal Academy of Arts; and the Guinness Collection. Works from artist Simon Garden feature in the Winter Exhibition at Red Rag Gallery in Bath. Starting 19 November Garden’s paintings are guaranteed to intrigue and delight. A number of good examples of Cyril Croucher's quirky art works are being offered for resale by Red Rag. The paintings are from a private art collection and most of the pieces were acquired directly from the artist. Croucher was born in 1951 and studied at Southend-on-Sea Art College. Houses and boats in their quaint harbour settings are a prime source of inspiration for Croucher. His approach to paintings developed out of a fascination with the height of harbour walls and the buildings which are often built on the harbours and quays. Opening this Sunday 18 May is the latest art show at the Red Rag Gallery in Bath. It is a solo art exhibition by leading British landscape artist Rex Preston. Around forty art pieces will be on display. Changing Seasons is the title of the latest modern art show at the Red Rag Gallery in Bath. It is a mixed exhibition which captures the essence of each season. Work from eleven of the gallery artists are featured in the show which starts Sunday 13 April and continues until 27 April. Starting today is the latest art show at Red Rag Gallery in Bath. This month there is a mixed exhibition focusing on 'Figures'. Works from ten gallery artists are being shown. The show continues until 29 March. To coincide with the Cheltenham Racing Festival which is taking place next week Red Rag have released some wonderful new equine paintings. The colourful oil paintings are from Scottish artist Catriona Campbell. Catriona studied at the Glasgow School of Art and was a student of David Donaldson and Mary Armour. Her paintings display a continuing passion and interest in figure painting. She has a real love and knowledge of horses which is evident in her work. The paintings from part of a show at the Red Rag Gallery in Bath, but maybe bought online from the website. 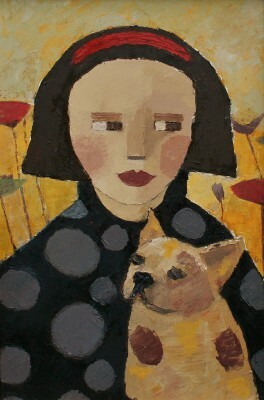 The latest artist to show with Red Rag Gallery in Bath is Louise Rawlings. Louise produces naive style paintings in mixed media. Speaking about her paintings she says: 'I can be inspired by anything from a small magazine cutting to a walk in the park with my beautiful English setter.' The inspiration for her works comes from observations on her daily morning walk with Alfie, her English Setter. She enjoys observing and capturing the characters she watches and meets every day in walks across the park. The latest art show at Red Rag Gallery in Bath is a mixed exhibition titled 'Grand Designs' featuring four artists who are inspired by architectural subjects. The artists are David Farren, Julian Sutherland-Beatson, Alan Tyers and Robert Wells. The show starts 16 February and continues for two weeks. Today is the opening of the Tate Britain latest show 'LS Lowry Lowry and the Painting of Modern Life'. This is a major exhibition of landscapes by the much-loved British painter and the first of its kind held by a public institution in London since the artist’s death. Focusing on the best of Lowry’s urban scenes and industrial landscapes including Tate’s Coming Out of School 1927 and The Pond 1950 alongside significant loans, this timely and carefully selected exhibition aims to re-assess Lowry’s contribution to art history and to argue for his achievement as Britain’s pre-eminent painter of the industrial city. The Bath Society of Artists Summer Exhibition will take place at the Victoria Art Gallery from 6 July – 31 August 2013. Current President of the Society and founding member of the Brotherhood of Ruralists, David Inshaw, will be displaying his most famous painting ‘The Badminton Game’ during the show.